All medical professions are looking for people who commit to excellence in whatever they do. As you think about your future, focus on what you do now and push yourself to do it as well as humanly possible - this investment of time and effort will reap enormous benefits down the road, regardless of your final choice of career path. To use applying to medical schools as a specific example, you should be striving for excellence in both academics and extracurricular activities. Doing well in courses (Getting the Grades) and on standardized exams will convince medical schools that you are capable of managing the intensity of medical school didactic years, and that you will remain a life-long learner. Acquiring an understanding of the medical field and demonstrating strengths of character that are required of successful physicians as part of your extracurricular activities and/or involvement in research opportunities are essential for making the strongest case possible that you are a competitive applicant. Especially important will be your ability to document and demonstrate your commitment to excellence in your personal essay and interview. To document the importance of doing well in whatever you may choose to do, consider the following. Several Clark undergraduates take advantage of the many opportunities to become engaged in scientific research, either at Clark or at the University of Massachusetts Medical School. Those who invest passion and attention to detail in their research are often recognized for their commitment by being a coauthor on articles describing their research in peer-reviewed scientific journals. Since 1985, at least 120 Clark undergraduates were coauthors on such journal articles. See a list of these articles (pdf). 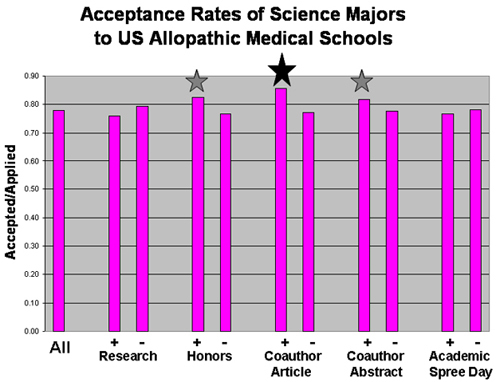 As a case in point, consider the Biology, Chemistry, and Biochemistry and Molecular Biology majors at Clark since 1985 who applied only to US allopathic (MD) medical schools (excluding offshore, osteopathic, dental, optometry, veterinary, and other allied health programs): the success rate for being accepted was 86% for students who were coauthors on peer-reviewed scientific publications; yet, in contrast, the acceptance rate was 77% for these science majors who were not coauthors. The relationship between research credentials (participating in research, receiving departmental honors, presenting results at on-campus research symposia (ASD), coauthoring published articles, or coauthoring meeting abstracts) and acceptance rates to medical schools is shown in the graph, below. The most pronounced correlations were evident for undergraduate journal article coauthors and, to somewhat lesser extents, students who received departmental honors or were coauthors on meeting abstracts.